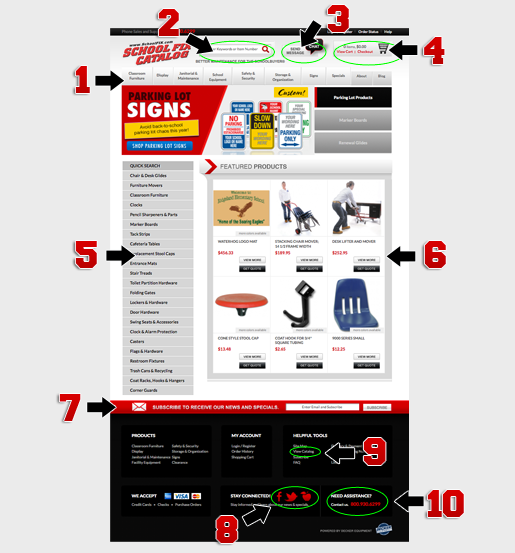 Our website is rich with features to enhance your shopping experience. We have created a few guides to make navigating these features easier. Click the links below to be directed to visual guides or Q&A's. If you have questions that are specific to the School Fix operations please visit our FAQ page here. For additional questions you can contact us here or call us at (800)930-6299. Use the references and explanations below to help you navigate SchoolFix.com. If you would like to request a specific visual guide be posted here please contact us here with your request. 1. Category Bar - Hover over the main categories to reveal subcategories below. 2. Search Bar - You can find what you are looking for by searching a product name, SKU number or keyword. If you are having trouble finding exactly what you are looking for, try shortening your search. 3. Live Chat - Click this icon to send a message to our call center. If someone is online you will receive live help. 4. Shopping Cart Overview - You can see how many items and the total cost of the items that you have added to your cart here. 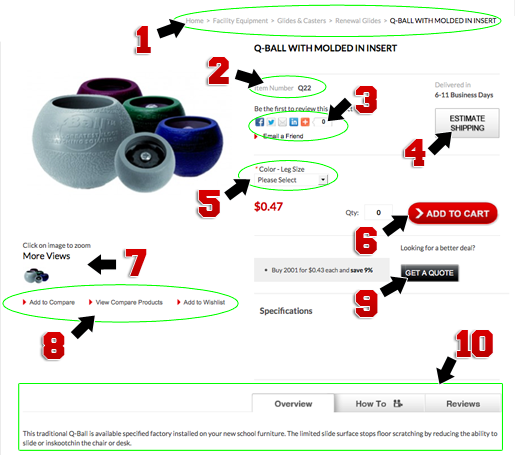 You can also view your cart and check out by clicking on the red links. 5. Quick Search- Here you will find the most searched products and categories. *Hint: Hover over some of the categories to reveal sub categories. 6. Featured Products - You can find the most popular items here. Click on the View More button to see product details. 7. Subscribe - Enter your email in the white box and press subscribe to be added to our email list. 8. Social Media - You can access School Fix's Facebook, Twitter and Blog using these icons. 9. View Catalog - Click this link to view our current catalog online. 10. Contact Us - You can contact us online by clicking where it says Contact Us or you can simply call the number listed. 1. Browse By - You can narrow your search by selecting a certain category, price range or color. 2. Navigation Trail - You can click on the links in this bar to go back to the base category. 3. View More - This button will take you to the individual product page where you can read details, get a quote or purchase the product. 4. 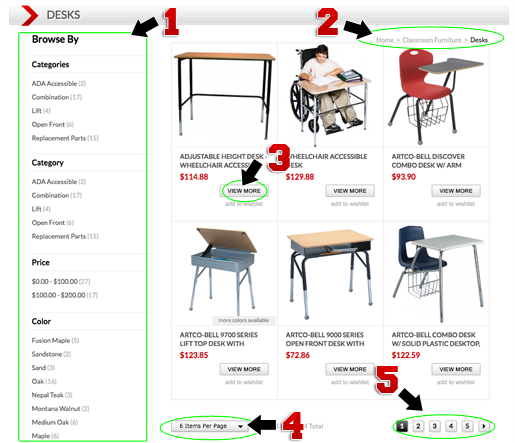 Items Per Page - You can organize your experience by changing how many products are on a page. 5. Page Navigation - Use this bar to navigate pages. 1. Navigation Trail - You can click on the links in this bar to go back to the base category. 2. 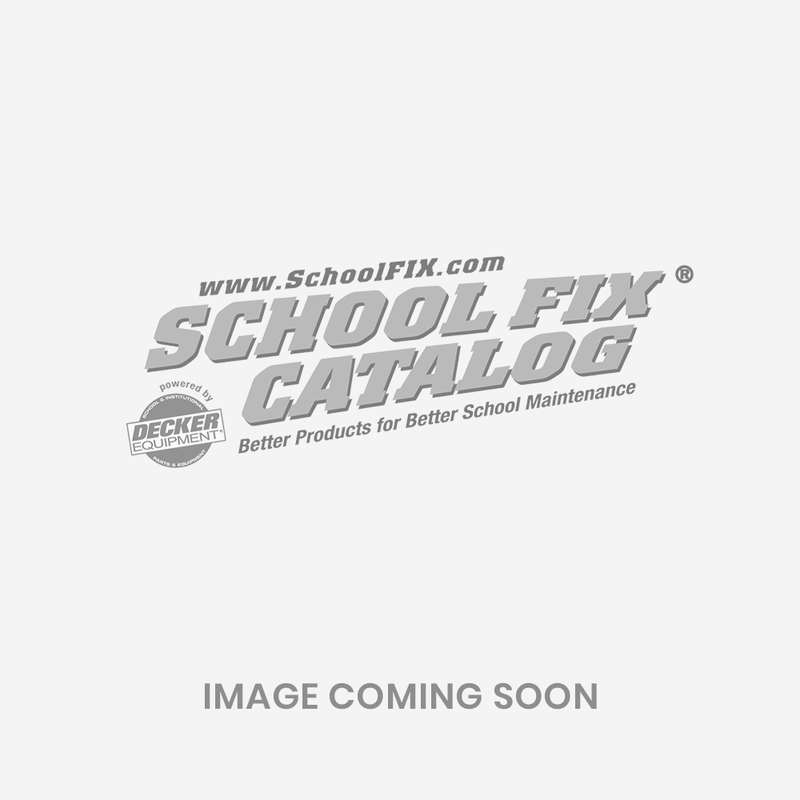 Item Number - The School Fix product number can be found here. 3. Share Bar - You can use this bar to share the product with friends and coworkers by clicking the icons in this bar. You can also write a personal review or testimony here by clicking Review This Item. 4. Estimate Shipping - You can click this button and a pop up will appear. Use this feature to determine approximately how much it will cost to ship this item. 5. Options Bar - Click the arrow button to reveal the options for this product. Click on the option you would like to order to select it. 6. Add To Cart - After you have selected your option and updated your quantity you can press this button to add the product to your online shopping cart. You will then be redirected to your cart, where you can then review your order and check out or you can continue shopping and come back later. 7. More Views - Some of our products have more than one photo. You can click on the small images to browse different angles, colors, sizes and uses. 8. Compare Bar - This bar allows you to add products to a compare list. Your compare list will give you an organized view of the products you have added to it. You will be able to easily compare descriptions, specifications, size and price. 9. Get A Quote - This is a popular feature. You can request a quote before purchasing. You can also use this feature to request a quantity discount. 10. Product Description - You can view the products description, videos and reviews here. Below you will find answers to common website questions. If you need further assistance please contact us here. 1. How do I find products on SchoolFix.com? You can enter a product number or key word in the search bar at the top and press enter or the magnify glass icon to browse items that match your search. You can also browse the category bar and narrow your search by selecting the Browse By categories on the left. 2. How do I request a quote? You can click on any of the Get A Quote buttons on the product pages. A form will pop up where you can enter your contact information and more details about what products you are looking for. You can add more products when requesting a quote by clicking the "+" icon. After you have filled out the form press the submit button in the bottom right corner. You can register by clicking the text in the black bar at the top right of the website that says "Login/ Register" or you can just click here. Click the Login/Register link at the top of the page. You will be redirected to the Account Login page where you can click the Forgot Your Password link. Enter the email used during registration and press submit. An email will be sent with a link to reset your password. Once you are logged in you will be redirected to your Account Dashboard, or you can press the Account link at the top of the page. On the left hand side you can change your email in the Account Information tab. You can change your shipping and billing address in the Address Book tab. You can change your subscription to our email newsletter here by clicking the Newsletter Subscriptions tab and unchecking the General Subscription box. Make sure to press the save button in the bottom right after you have made any changes. Login to your account using the Login/Register link in the black bar at the top of the page. Once you have logged in you will be redirected to your Account Dashboard, or you can click the Account link in the black bar at the top of the page. Your recent orders will appear on this page. Click the View Order link to the right of the corresponding order you would like to track. You will be redirected to this order. Here you can view order details and track your shipment. If you don't see your order in Recent Orders you can click the My Orders tab on the left.